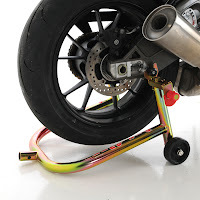 KTMtwins.com KTM Motorcycle and Product News: Pit Bull Stands are here and waiting to support your ride! Pit Bull Stands are here and waiting to support your ride! Lightweight and as strong as a Pit Bull. Pit Bull Stands are the choice most of amateurs in the paddock who are not sponsored and need their dollar to go as far as possible. Thank you for the compliment. We work very hard and hope that everyone has a great experience here at KTMTwins.com. We will continue to offer the latest and greatest items for your KTM and hope to continue to provide top notch customer service.